Part of the reason was that the Puritans wanted to purify Christianity, and their idea of purifying it was to eliminate all religious activities that did not appear in the Bible. Since the people in the Bible did not celebrate Christmas, the Puritans felt they should not celebrate it. The other reason for abolishing Christmas celebrations was due to the offensive way in which the English celebrated their holiday. Traditionally on Christmas Day, gangs of young males from the poor areas of the city prowled the better neighborhoods. They sang Christmas songs and banged on the doors of homes. 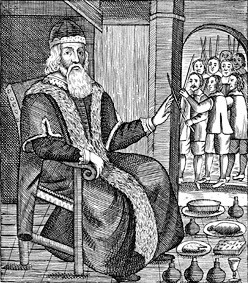 They also demanded servings of the seasonal drink, wassail, a strong wine flavored with spices. If the young men were not invited into the home, they smashed the doors or shattered the windows, then forced their way inside. After “visiting” five or six homes, their drunkenness and rowdy behavior became a serious problem. Cromwell was so insistent on squelching this behavior that every Christmas Day, he sent 30,000 troops into the streets to eliminate all trace of anything festive. If his soldiers so much as smelled goose cooking, they entered the home and confiscated all of the food. I am amazed and impressed by how far we Americans have come, from the days when Christmas celebrations were a crime to the wonderful celebrations we have today. What I learned at the library enhanced my appreciation of this celebration. Now, I wish to share it. I hope that this story will make Christmas more meaningful for you, also. The history of Christmas in America evolved slowly over a 35-year period during the early 1800s. By then it was no longer a crime to observe Christmas. Still, nothing special was done. 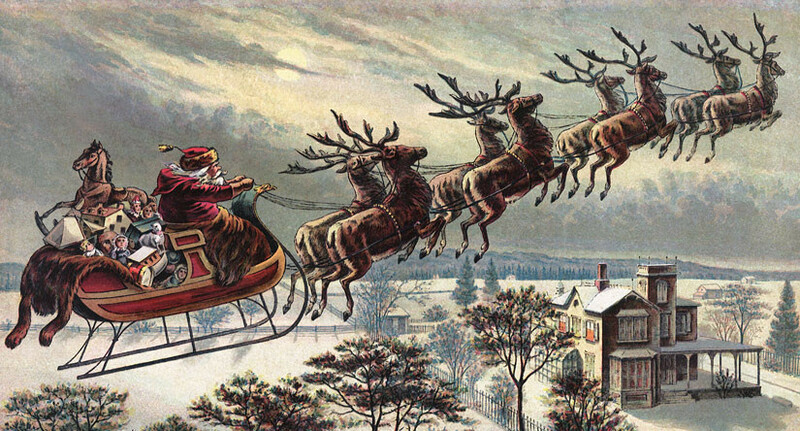 All through the 1700s and well into the 1800s, Christmas had been just another workday. But the members of discussion clubs, which were composed of clergymen and authors on both sides of the Atlantic, deeply longed for something wonderful to happen. The first significant part of our story begins with Rev. Clement Moore, one of those clergymen. Imagine the scene. It is Christmas Eve in New York in 1822. Rev. Moore is riding home in the backseat of a sleigh. Next to him on the seat is a large turkey, which he will serve to his family on Christmas day. A light snow falls… the kind with those great, big snowflakes. Moore snuggles under a blanket and closes his eyes. As he listens to the jingling sound of sleigh bells and the clip-clop of the horses’ hooves, he feels more and more dreamy. His thoughts drift to his children, and his desire to do something special for them. Since Clement Moore is a poet, a story begins to form in his imagination. The story appears as if it were a vision. 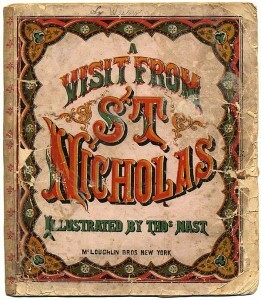 He sees a chubby little man in a red suit… St. Nicholas. Like Clement, he too is riding in a sleigh, but instead of being drawn by horses, the sleigh is soaring across the heavens, led by reindeer. It lands on a rooftop. St. Nick leaps from the sleigh with a bag full of toys across his back, and quickly drops down the chimney. We all know the rest of the story. By the time Rev. Moore reached home, his poem was complete. After dinner, he called his children to the fireside and read the poem. This was the first time a father read “Twas The Night Before Christmas to his children on Christmas Eve. His little boys and girls were so enchanted that the next day they told their neighbors about the wonderful story Daddy had read to them. These folks asked for copies. Soon, it was printed in a newspaper. Before long it surged across the sea to England! From there Rev. Moore’s poem spread through the world. Today, fathers in almost every country read it to their own children on Christmas Eve. The instant popularity of this poem tells us that The Night Before Christmas was a powerful piece of literature. So powerful that it changed religious culture. In fact, it caused a revolution. How? Moore’s poem changed Christmas from an outdoor ruckus to an indoor celebration. Reading the story to children brought Christmas into the home. It domesticated Christmas, gave people a new vision of what a Christmas celebration could be like. From a rowdy English street festival, it became a child and family centered time of the year. A real warm fuzzy. And, it set the standard for our concept of Santa. Of course the church pastors were delighted to see renewed interest in this holy day. They responded by offering special services. Not only did this increase the indoor nature of Christmas, it also sparked a more spiritual approach to the day. The next event in the history of Christmas in America happened in Boston… Ground Zero for Puritanical traditions. 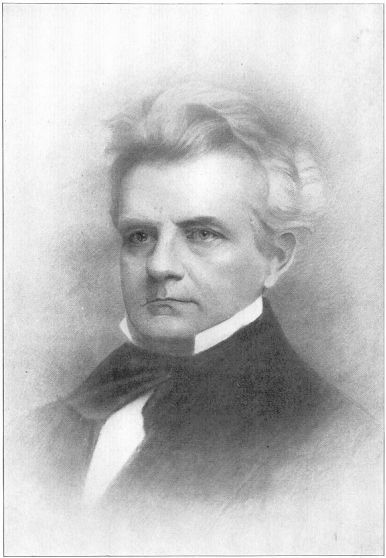 It was early December in the year 1827, and a young music publisher, Lowell Mason, was in his office. Mason sat frowning at his desk. The church pastor had asked him to play the organ for the Christmas Day service. He’d done this last year, and been very disappointed in the music he was forced to play. The pastor had insisted that it be reverent. But his idea of “reverent” was music that was somber and monotonous. Until late into the night, deep in thought, the young man tried to figure out what he should do. Soon he remembered a melody he had written a few years earlier. It was a lively piece based on two songs in Handel’s Messiah. Mason knew it would make the perfect musical accompaniment. But he needed lyrics. The lyrics fit his music seamlessly. On that night, Joy To The World was born. What a gift for the congregation on that Christmas Day! During the first song, people got to sing dynamic music that stirred their souls. Such an emotional outburst caused an extraordinary elevation of the worship experience. And, the singing of joyful Christmas carols quickly spread to the other churches. The last scene we will explore takes us back to England. It is 1843, and Charles Dickens has published a book called A Christmas Carol. Because of its powerful message, it quickly spreads to America, then around the world. The effect of this story draws the Christmas celebrations even further inside the human heart. How so? It dramatizes the spirituality of Christmas and the need for generosity. How did this tale come to be? What prompted Charles Dickens to write this scary, brutally honest story? Was the Holy Spirit busy again? In Dicken’s England, there were two classes of people: the very rich, and the very, very poor. What distressed him was that the rich ignored the poor. They felt no compassion because the poor were not real to them. Via this story, Dickens addressed the rich in the hope of awakening their sense of responsibility. 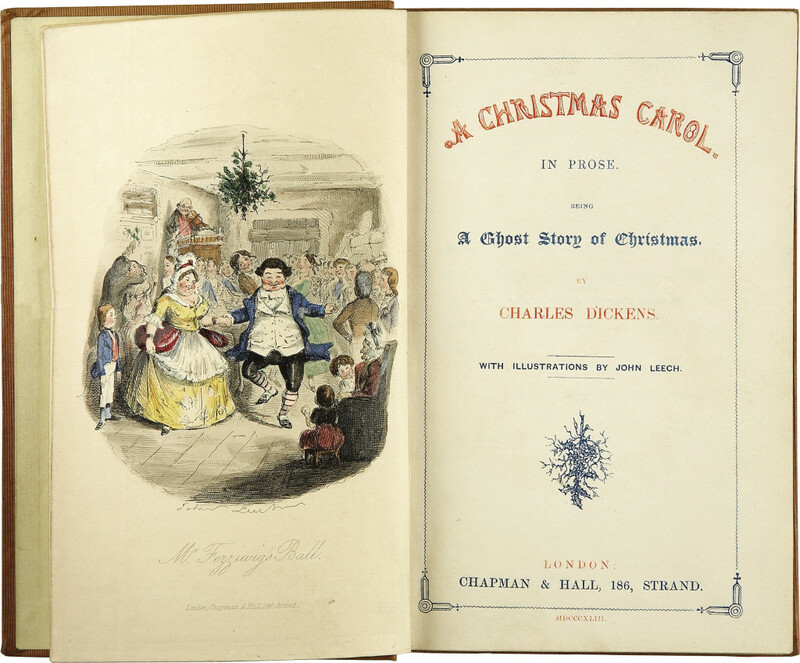 Title page of the first edition of A Christmas Carol. 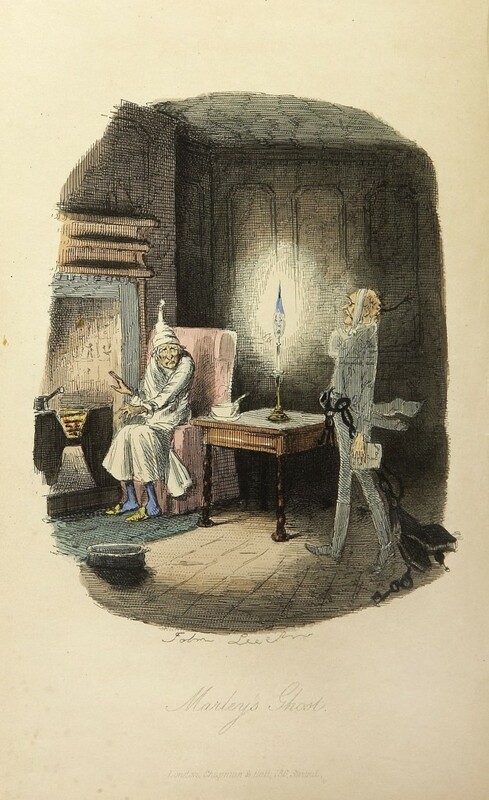 The second ghost helps Scrooge feel the happiness of sharing Christ’s love. Scrooge and the ghost of Marley. Another main character in the story is Scrooge’s nephew and employee, Bob Cratchit. He is the opposite of Scrooge. Not only is he poor, Bob is also a saintly man. As such, he is our role model. No matter how mean Scrooge is to him, Bob Cratchit never complains or criticizes. And every year, he invites Scrooge to dinner on Christmas day. Of course Scrooge always refuses… until his encounter with the third ghost, who gives him a vision of his barren future should he continue his mean spirited ways. In the end, Scrooge awakens a changed man. Eagerly, he joins his nephew’s family for Christmas. 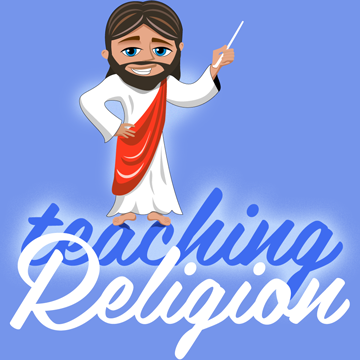 There we meet Tiny Tim, and the child / family centered theme is reinforced. Scrooge is kind to the Cratchits. He is moved to provide for Tiny Tim, so the ending of this story is a happy one. Everyone who read A Christmas Carol was drawn to the scenes of grinding poverty. For this reason, Dickens felt that his story was a success. It created the awareness that charitable giving was an indispensable part of the Christmas celebration. This journey through the history of Christmas in America led me to recall one of Mother Teresa’s wise instructions… Each day do something beautiful for God. Indeed, each of the men in our story–Clement Moore, Lowell Mason, and Charles Dickens–did just that. My thanks to you, Clement. Thank you Lowell. Thank you Charles.